I could make one for you Eldar. 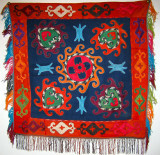 Embroidery style of Hazara, esp. 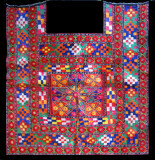 the purses, have the same style which we can observe in the traditional embroidery of Swat, Pakistan. But I am not in the position to solve the puzzle because, in historical context there are very clear links of Afghan arrival and settlement in the region; Mehmod Ghaznavi in the 11th c.Yusufzai in 15th c. and some nomads (Kohistani), but it is hard to trace how the tradition reach the region. Since there is a large geographical distance between the two regions. And the style that is typical in other areas of Afghanistan such Herat, Kabul, Jalalabad etc. which are more near and accessible to this area, have no resemblence in this tradition. Please if you can help in this context to find the traces of the journey of stitches (cross, back and darning)and the links between the two. amazing...the work is original, unique and gorgeus!!!!!!!!! Thanks for sharing such a fabulous handicrafts. Very artistic too. I like it....... a lot. stunning gallery! my girlfriend weaves rugs! she will love to see these! Such an exotic gallery, with samples of amazing colour-ways and dexterity. Super. so great to see all this wonderful work.. thank you for make this gallery and let us know it! Such an amazing amount of skill and work has gone into these fabrics and also into your lovely photographs.